I like to use Costco for gas, snacks, and bathroom breaks during road trips, and the Louisville Costco was an easy stop on my recent trip to Detroit. The product mix was different. Two things hit me. The first was the propane station near the gas station. 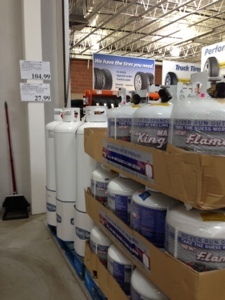 I've never noticed propane for sale at another Costco. Also, Louisville Costco had propane canisters for sale. I tried to think of possible reasons why propane would be such a good seller in Louisville. I'm guessing barbecue? My other surprise was fireworks. West Nashville Costco doesn't have these. Does the Louisville store have a liquor store within, or attached? Are there Derby or horse-racing items (Churchill Downs) available at all? 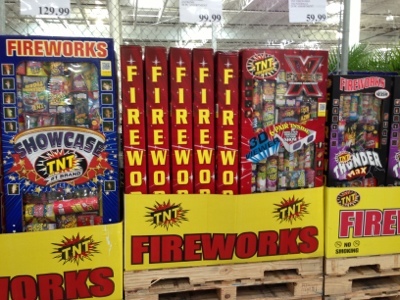 And I have to ask - how close are the shelves of fireworks to the barbecue grills and other backyard cooking paraphernalia?